The project was approved by the National Energy Policy Council last Thursday. Chatchai Mawong, Egat’s director of hydro and renewable power development, said the authority plans to install floating solar panels at the Sirindhorn hydropower plant in Ubon Ratchathani province as the first location. Egat will install 45 megawatts at Sirindhorn dam at a development cost of US$1 million (31.5 million baht) per MW. The floating solar panels at the dam will begin commercial operation in 2020. 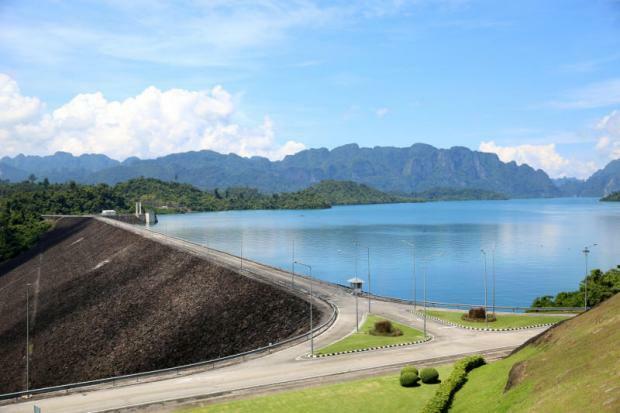 The full plan includes eight hydropower plants nationwide with a combined capacity of 1,000MW over the next two decades, but the five pilot dams are Sirindhorn (Ubon Ratchathani), Srinakarin (Kanchanaburi), Ratchaprapha (Surat Thani), Bhumibol (Tak) and Ubol Ratana (Khon Kaen). He said both systems of power generation are unstable because of limited resources, so Egat plans to combine and manage both systems to ensure stability and lower generating cost. In addition, power transmission lines can utilise only 40% of capacity because each dam has a duty to provide water for agricultural areas and natural resources for communities as a first priority, so each hydropower plant cannot generate power 24 hours a day. “As a result, the floating solar panels are designed for use during idle periods in which dams cannot generate power, using the leftover capacity,” Mr Chatchai said. He said an energy storage system using lithium-ion batteries can be included in hybrid renewable power projects in the future, once Egat’s generating cost becomes competitive enough against fossil-based power. The business model for the next step of hybrid renewable power projects will take the form of joint ventures with private investors, said Mr Chatchai. Egat teamed up with Siam Cement Group (SCG) to conduct R&D for materials to build floating solar panels. The R&D site for floating panels is at Tha Thung Na dam in Kanchanaburi province, with a capacity of 250 kilowatts. Both Egat and SCG will run their R&D activities until 2020.